The Mounties get their woman! Our site visitors may remember that a few weeks ago we reported that former Maybole couple Lawrence and Anne Malone had come back home for a double celebration and had a family get together. Unfortunately, not all of their own family could come with them and our photo shows one of the reasons daughter Echelle was unable to be back in her old home town – she was graduating as a member of the Royal Canadian Mounted Police! 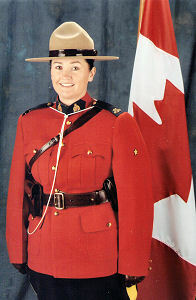 Echelle, formerly of 28 The Loaning, graduated as valedictorian – top graduate – of Troop 4 at the RCMP Academy Regina, Saskatchewan and has since been posted to Alberta to a town near Calgary called Airdrie!